Performance optimization in the world of inside sales and call analytics often focus on vanity metrics. Vanity metrics are surface-level data points that are good for comparison, but don't necessarily lead to actionable insights. For example, reports on number of calls made or connected can give you a good sense of rep performance, but provide little insight into why the numbers may be the way they are. You may notice a lower call volume due to seasonality or tracking error. By focusing on why the number of calls seem low or high, you’re able to make better-informed decisions on how to optimize or bring awareness to the sales process. Using Looker, our inside sales team is able to view and analyze data beyond vanity metrics, and instead focus on actionable metrics – those that drive behavior, growth, and learning. Call analytics encompass a set of analyses used to optimize how Sales reps process leads. Marketing and Demand Generation go through painstaking effort to produce leads, and having an analytical process in place ensures visibility and accountability between Sales and Marketing. Similarly, these systems helps Sales Managers create expectations for their reps, and provide insight into if and how those expectations are being met. 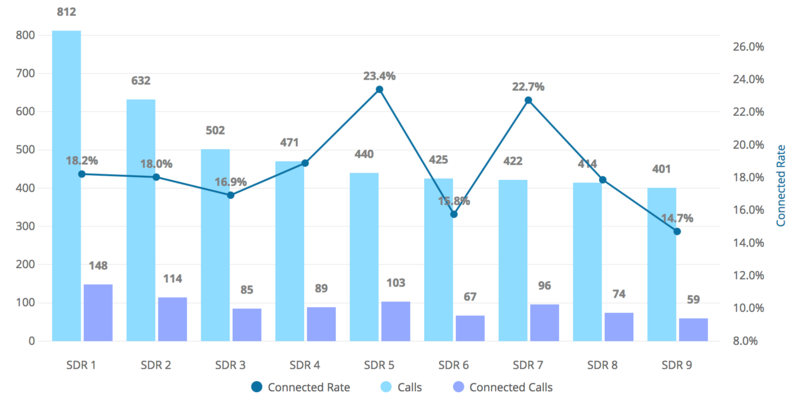 Here are some phone call tracking metrics and call analytics dashboards we use to evaluate our Inbound Sales Development (SDR) team, starting with simple call counts for comparison and moving into more complex efficiency rates that impact behavior and sales effectiveness. Our Inbound team is primarily responsible for responding to Marketing-generated leads, qualifying them, and routing them to our Sales team to initiate the sales cycle. Let’s take a look at the top call metrics we use to report on sales effectiveness, and how we can make those metrics more actionable. Number of calls made is the most common metric I hear when discussing inside sales. Many sales managers think that putting a goal around this metric is sufficient to set their team up for success. The thinking is that it provides an activity number to work toward, and can be a good lens into the level of effort individual reps are putting forth. But stopping there is a mistake. While it's necessary to set expectations, this metric doesn't tell you much about efficacy and doesn’t give any opportunities for true optimization. Is the rep actually speaking to anyone, or are they just logging sales calls? Is SDR 1 really more productive, or are they burning themselves out? 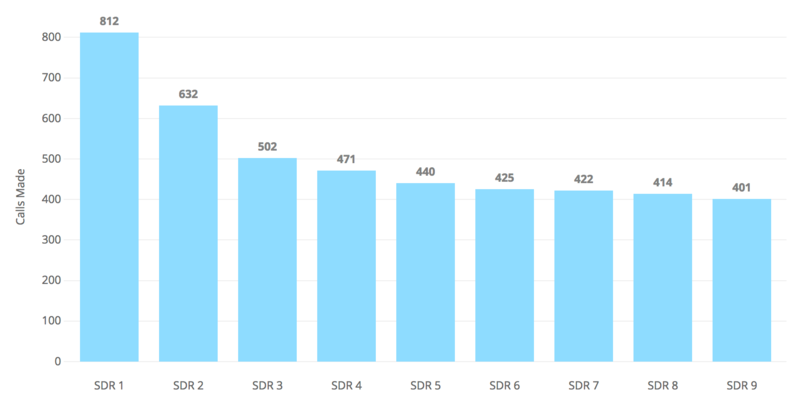 Managers may be impressed by SDR 1's high call volume, and direct the rest of their team to achieve similar results. But more analysis is required to truly optimize the sales team’s process and performance. Here's the same view of calls made, adding in how many of those calls are connected – how many of each rep’s phone calls result in conversations with prospects? A rep’s goal is to have as many conversations as possible to initiate the sales cycle, and together with calls made starts to give a fuller picture of each rep’s efforts. A common characteristic of vanity metrics is that they can be “gamed,” created or influenced in ways that are disingenuous. Calls made falls into this category, since reps could theoretically log calls after hours when there’s a very low chance their prospect picks up. The measure of connected calls is much tougher to game, since it requires a conversation occurring between the rep and the prospect, and therefore gives a better level of insight into a rep’s effectiveness. We're starting to get a bit more info, but this alone is still not super actionable at a glance. One quick addition to this dashboard will start to point us in the right direction. Connected Rate gives a good apples to apples comparison of efficiency. 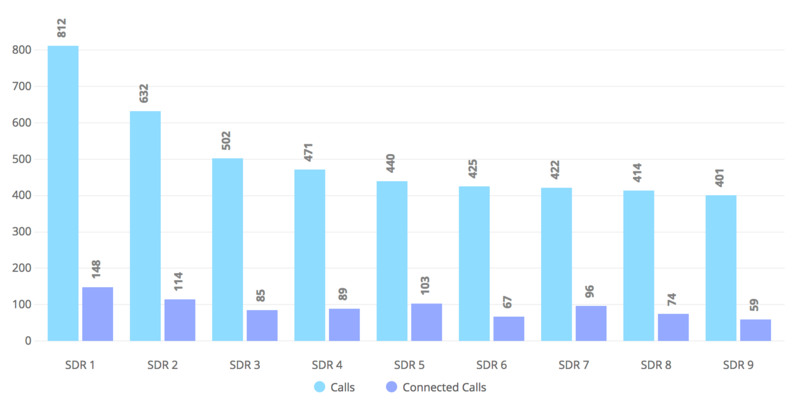 This is a simple calculation of Connected Calls ÷ Calls made, and provides a more complete view into each rep’s process. What are SDR 5 and SDR 7 doing differently to connect with more people? You can interview reps for anecdotal thoughts, or do further quantitative analysis on other factors that could affect this rate – for example, what day and time are reps making calls? Leadership should tease out those best practices and share them with the rest of the team to increase everyone's efficiency. SDR 1 is making the most calls, but could benefit from 5 & 7's strategies around connecting with more people. Similarly, 5 & 7 have something to learn about increasing call volume. Action items exist for each rep here, as well as for inside sales leadership. Now we can shift a bit to focus on results. Typically, the main indicator of success for reps is the number of Meetings they book for the Sales team. But only focusing on results lacks a certain amount of context – just like only focusing on calls made – so I'll skip that view and compare results alongside activities. Above is a dashboard of Connected Calls next to a count of Meetings Booked. Again, this is helpful for comparison purposes, but is not ideal to take action from. The addition of another metric to this dashboard makes a major difference. 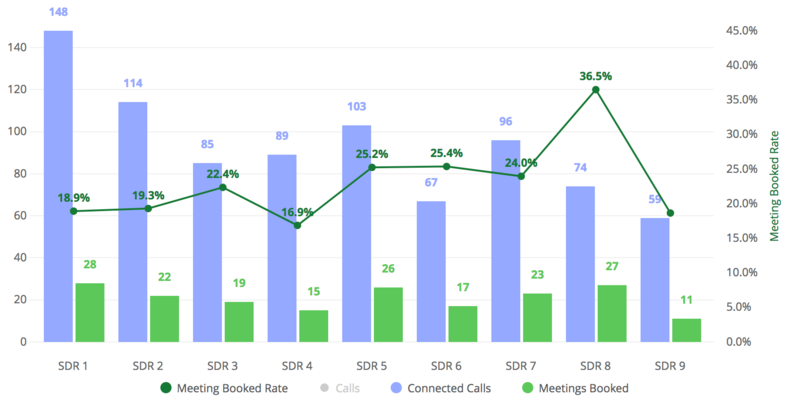 The green line shows Meeting Booked Rate, which is the percent of Connected Calls that led to Meetings Booked. This is created by dividing Meeting Booked count by Connected Call count. Just like the report with Call Connected Rate, we now have a good point of reference to gauge sales efficiency. 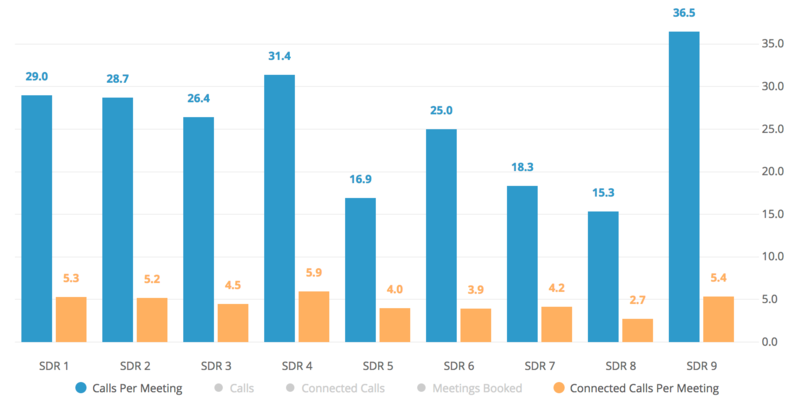 SDR 1 and SDR 8 have a similar quantity of Meetings Booked, but SDR 8 is twice as efficient. 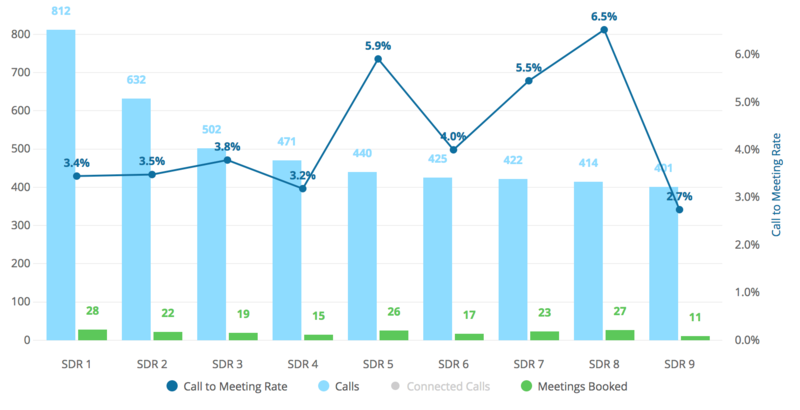 What can SDR 1 learn from 8's phone techniques to improve their meetings booked rate, and what can 8 learn about increasing call quantity? This kind of analysis allows team members to learn from each other's personal processes and consequently improves the output of the team. Inside sales leadership should use this information to inspire their coaching and training sessions. Sit in on call sessions to understand strategies and techniques, and be sure that the team continues to build on the existing foundation and improve the process. 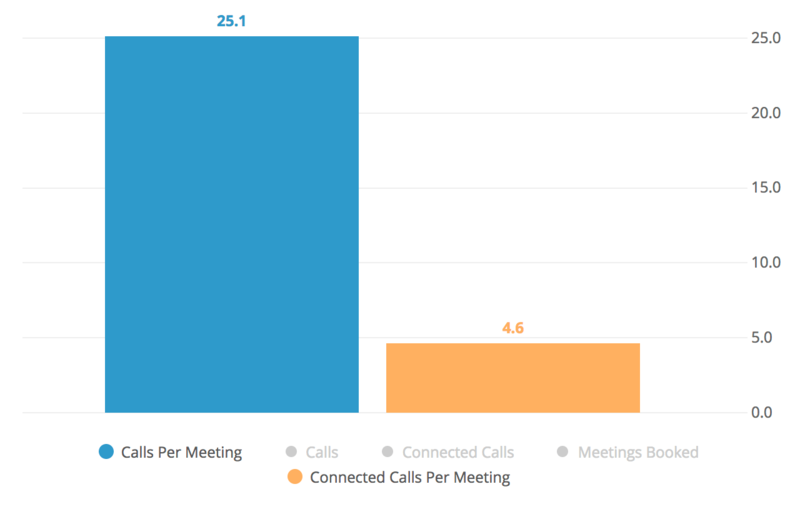 Back to the Calls metrics – here's a look at the overall percent of calls that turn into meetings (Meetings Booked ÷ Calls Made). This can be useful for a Manager to set or reset expectations about how many calls reps should be making to hit their meeting goals, and is another way to evaluate rep efficiency. This gives similar information as the Meeting Booked Rate from Connected Calls Dashboard in a slightly different view. These percents can be a bit tough to interpret, so flipping them around may lead to more actionable insights. In this dashboard, we see that SDR 1 is making 29 calls for every meeting booked, where SDR 5 is making 16.9 calls per meeting booked. Similarly, SDR 1 gets a meeting from every 5.3 people he they speaks with, where SDR 5 gets a meeting with every 4 people she speaks with. This is a good way for reps to understand their efficiency and sales effectiveness, and it helps dictate their day-to-day planning and forecasting. 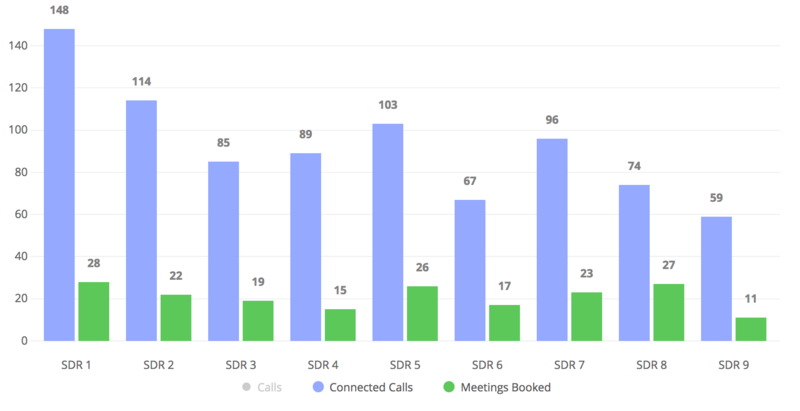 If SDR 2 has a goal of booking 2 Meetings per day, she can set activity targets of ~56 calls and ~10 connections per day to get there. Taken at an team-wide aggregate level (below), this is great analysis for the inside sales team to do headcount and lead flow planning. Starting with the goals around Meetings Booked, management can make informed decisions on how many reps to staff based on the inside sales goals. This kind of predictability is essential for scale and growth. It's great to monitor effort and performance through the lens of data, and it's even better to utilize your call measurement and tracking analysis to influence action and behavior. Challenge yourself and your team to find and focus on these actionable inside sales metrics. This removes a lot of the guesswork from staffing and workflows, and ensures that individuals, managers, and teams know how they can continue to improve and what they need to do to hit their goals.